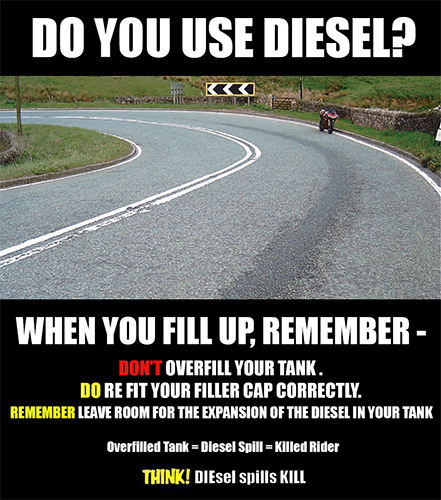 Diesel Spills – Let’s Cap Them! 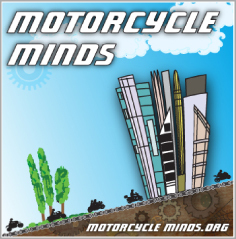 You are here: Home / Rider News EU 2011 / Diesel Spills – Let’s Cap Them! 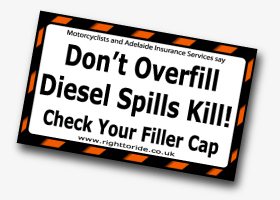 Right To Ride’s concerns regarding Diesel Spills spreads with a warning of the dangerous with advice to stop spills through the “Lets Cap Them!” campaign from Co Mayo. 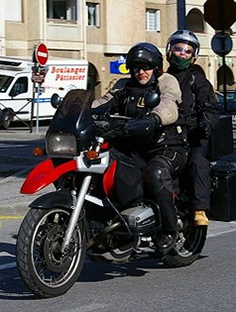 Diesel/oil spills on Mayo’s roads cause an unacceptable hazard to Motorists, Motorcyclists, and they have asked us to help reduce the number of spills they have to deal with. 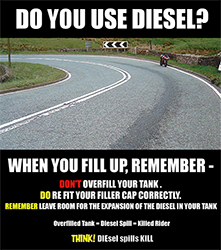 Diesel/oil spillages are hazards which threaten the safety of all road users. Vehicles can skid, swerve and lose control on patches of diesel, endangering their drivers, passengers, other road users, pedestrians and property. Wet weather can worsen slicks and, coupled with bad light, can sometimes make them impossible to see. Diesel can take up to 100 days to break down so can remain on the road surface for a long time, often reappearing only during rain. Apart from the hazards it creates it makes economic sense not to waste fuel at its current price and the clean up of these oil spills it a large cost to local authorities. The problem is mainly caused by drivers forgetting to put the fuel cap back on properly, as well as the overfilling of fuel tanks on vehicles. “Added to that the apparent increase in the number of people commuting on two wheels makes the time right to give this problem the attention it deserves. “It is a fact that many drivers are unaware of the danger caused by even a small amount of spilled fuel. Raise the awareness of the problem, and the potential consequences and dangers to all road users. Encourage the reporting of diesel spills so that quick remedial action can be taken. Promote education at haulage companies, drivers, farmers, bus companies, petrol filling stations etc. about the problems caused by overfilling, poorly fitted fuel caps and poorly maintained vehicles – all of which can lead to diesel spillage. This is not a problem for Mayo alone. There is national recognition amongst motorists and rider groups that diesel spills are a very real issue and it’s in this context that we are trying to make progress in our own region. If we can cap this problem in Mayo we’ll be making a real contribution to solving a national, as well as a local, threat to biker safety and motorist safety. Clearly though we need your help to do it. If you run a diesel vehicle don’t overfill your tank and remember to replace your fuel cap properly – it’s money down the drain if you don’t. Ensure your vehicle is well serviced. If you see a problem, get it fixed immediately before it causes problems to others. As well as causing hazards on the road, diesel also corrodes the bitumen road surface causing longer term safety problems. If you drop diesel on the roadway you could be recharged with the cost of repairing the damage. Early reporting is essential. The earlier they are reported, the sooner they can be dealt with. If you are responsible for diesel vehicles in your work, or think that your fleet, safety or depot manager might be interested in helping to reduce wasteful and dangerous spillages, get in touch with us today. How do you spot a diesel spill? Posters and stickers will be sent to Fleet operators, heavy goods test centres and oil distribution companies around the County.